The first half was largely dominated by Atlanta, with a pair of RB Devonta Freeman rushing touchdowns and a QB Matt Ryan touchdown pass to RB Tevin Coleman helping the Falcons to a 24-7 halftime lead. In the second half, the Packers would make a come back push, with two QB Aaron Rodgers touchdown passes to WR Davante Adams and RB Ty Montgomery, but ultimately they would fall short and Atlanta would go on to win 34-23. With that, we give you our PFF exclusive takeaways from the contest for each team. Mack had an excellent outing in the run game, continually dominating the Packers’ interior defensive line and showing off his athleticism by quickly getting to the second level to seal off linebackers to create running lanes for Devonta Freeman and Tevin Coleman. Mack was also perfect in pass protection. There were a few times where Freeman flat-out beat an unblocked defender in the hole to get into the second level. He finished the night with five runs of eight or more yards, forced three missed tackles, and gained nearly half of his yards after contact. In the slot Brian Poole was targeted a lot in this game, with 9 targets coming his way, however he was able to knock down 2 passes and the catches he did allow, 6 of them, he was able to keep the receiver in front of him. Poole only allowed 6 yards after the catch. This has to go down as an off performance for Aaron Rodgers. The majority of the game Rodgers was forcing the ball into coverage, where he had two dropped interceptions, an actual interception and the bad decision to try and throw the ball which became a fumble that was returned for a touchdown. Rodgers did show his strength when he hit Adams for the touchdown in the fourth quarter. When Rodgers was pressured he only completed 36.4 percent of his passes. There weren’t many bright spots for the Packers’ defense, but rookie CB Kevin King had a solid showing in just his second game. 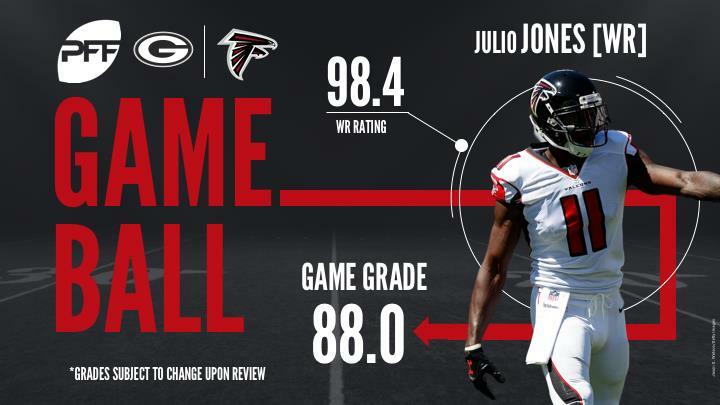 King did not allow a catch on any of the four throws into his coverage on 32 cover snaps, tipped a pass intended for Julio Jones just enough to cause it to end up incomplete, and made an immediate tackle for no gain in the flat. Burnett has been playing more in a linebacker role thus far this year and has had success in both games. He lined up as a linebacker on 53 of his 58 snaps versus Atlanta. In coverage he allowed just two catches for a combined 12 yards on three targets, while breaking up the third pass.